AC Milan striker Gonzalo Higuain has been snapped appearing to prepare to fly from Italy to London ahead of what looks like an imminent transfer to Chelsea. The Argentina international has been strongly linked with a January move to the Blues for some time, with Calciomercato among the sources to recently state a deal looks close to completion. 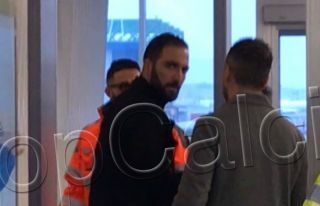 And now Italian journalist Michael Cuomo has posted an ‘exclusive’ photo on his Twitter page of Higuain at the airport, stating he’s about to fly from Milan to London. Time to get excited, Chelsea fans! Higuain vs Morata stats – is the Chelsea new-boy really an upgrade?